Lt Col Harold Wyllie OBE RSMA (1880-1973). Watercolour signed and dated 1935. 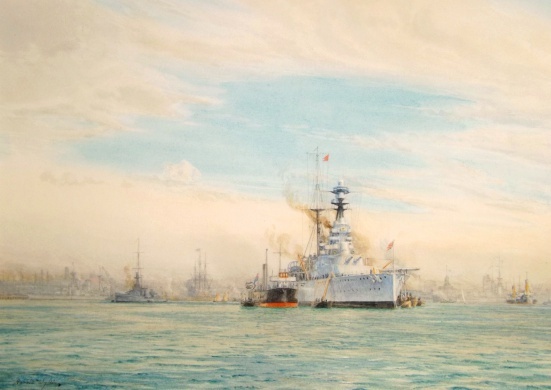 Provenance: first exhibited in the Big Marine Exhibition of 1938 staged at Southsea, Hampshire and opened by HM King George VI, this watercolour is mentioned in "20th Century Marine Painting" by Denys Brook-Hart. In 1935 HMS ROYAL SOVEREIGN (Captain Bertram Ramsay MVO RN) was a unit of the 1st Battle Squadron (Vice Admiral Sir Charles Forbes KCB DSO) of the Mediterranean Fleet. Despite the demands made on that fleet by the Abyssinian Crisis the Commander-in- Chief (Admiral Sir William Fisher GCB CVO) was given last minute approval to bring some units of the fleet home for the King's Siver Jubilee Review to be held at Spithead on 16th July and these ships, together with HM Ships from other Foreign Stations started arriving in their home ports from mid June for essential defect rectification and some tiddlying up of paintwork. 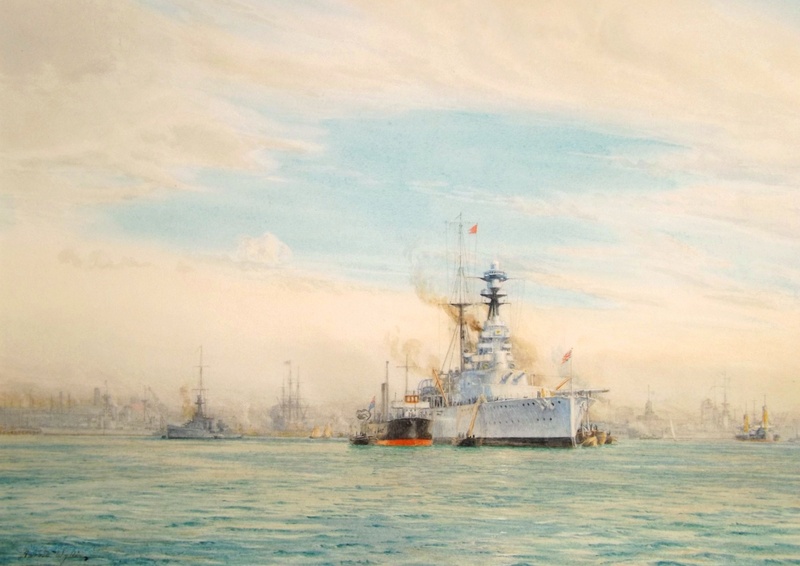 This is possibly when this watercolour of Portsmouth harbour was painted by Wyllie: an ammunition lighter is alongside ROYAL SOVEREIGN, flag Bravo ( I am embarking explosives) is close up at the main and A turret is trained over to port. Semaphore Tower lies over to the right of the painting, Spithead is to the right (south) and beyond; and just left of centre in the background we clearly see HMS VICTORY wearing the flag of Commander-in-Chief Portsmouth (Admiral Sir John Kelly GCVO KCB). Wyllie has annotated the back of the picture with some further names: HOOD (it looks like her long, symmetrical shape at the left of the painting); NELSON (as Home Fleet flagship she was berthed in the prime berth, South Railway Jetty, and is just discernible over to the right beneath Semaphore Tower); and NEPTUNE who is not apparent. What looks very like a light cruiser of the C or D Class is seen lying to a buoy off ROYAL SOVEREIGN's starboard quarter : the large, bulky foremast with grouped control positions, and diminutive main, fits several modified ships of the C and D classes, many of which were in the Reserve Fleet which ties in with the dark grey colour of the cruiser Wyllie has observed here. Although the Commander-in-Chief Home Fleet (Admiral the Earl of Cork & Orrery GCB) was expecting to command the Review, Admiral Fisher of the Med Fleet just pipped him in seniority in the Navy List, " a fact which did not altogether please me" Lord Cork candidly admitted in his autobography! It was the intention to practise the two fleets in the manoeuvres they would perform for the King on the day following the Review but thick fog over the Solent and its approaches wrecked that plan and instead ships proceeded directly to their anchor berths in the line, ROYAL SOVEREIGN ("Tiddly Quid" to the lads) lying with her neighbours in the line, her flagship, HMS QUEEN ELIZABETH (Captain S St Leger Moore RN) and HMS RAMILLIES (Captain R Leatham RN). The day of the Review itself produced glorious weather and concluded with a flypast of naval air squadrons - possibly a world first for any naval review; and that evening aboard the Royal Yacht and before the celebration dinner given by the King for all flag officers, the two Commanders-in-Chief were appointed GCVO by His Majesty. The steampast and gun practice for the King the next day south of the Isle of Wight, however, was blighted by wind and rain although the two fleets did manage their steampast and man and cheer ship in rapidly worsening conditions. Shortly afterwards the Mediterranean Fleet ships hurried back to Malta only to be moved eastwards to Alexandria in August as Malta, the main naval base, was considered too close to Italian airfields for comfort during this crisis. ROYAL SOVEREIGN went on to serve throughout WW2, being transferred to the Russian Navy in 1944 before returning to the Royal Navy and subsequently the scrapyard: she was worn out, a veteran of both world wars. Bertram Ramsay, her captain here in this painting, was promoted Rear Admiral on leaving the battleship some 4 weeks after the Review and joined HMS NELSON as Lord Cork's Chief of Staff. But when the latter moved on, Ramsay fell out with his succesor, the arch centraliser Admiral Backhouse, and resigned only to be recalled for duty by Admiral Pound, the new First Sea Lord, in August 1939 and appointed Flag Officer Dover. Thus Ramsay was the man who masterminded the successful Dunkirk evacuation of summer 1940 for which he was richly rewarded with a KCB. Sir Bertram subsequently became, in 1943, Allied Naval Commander-in-Chief Expedition Force, the planned invasion of Europe; he was killed in an aircrash in January 1945.